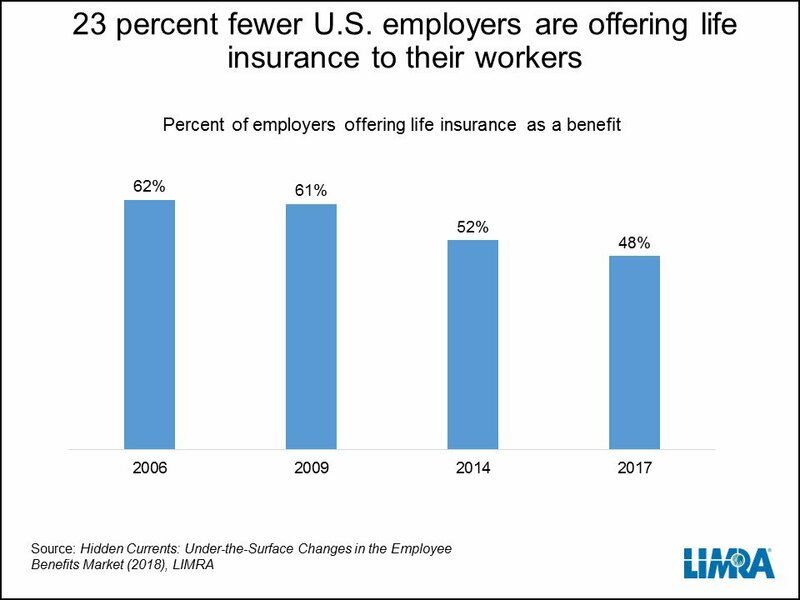 In 2017, only 48% of employers offered life insurance to their workers, a 23% decline from 2006. This continues a steady of decline in employer-sponsored life insurance since 2006. While access to employer-sponsored life insurance has declined, employees continue to recognize the value of life insurance. Six in 10 employees say life insurance is an “important” or “very important” benefit, regardless of whether they currently have it available to them through their employer. In fact, it is one of the top five benefits listed by employees, included with dental, medical, paid time off and retirement. 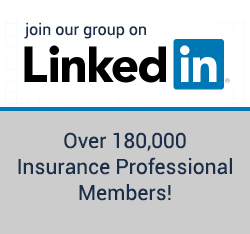 In 2016, LIMRA research revealed that more Americans rely on group life insurance than individual life insurance (108 million vs. 102 million) to protect their families. This was the first time in history that employer-sponsored life insurance exceeded individual life insurance. Among American households without benefit of group or individual life insurance, three quarters say they would have immediate or near immediate trouble paying for basic living expenses if the primary wage earner died. The number drops to about half for those households with group life insurance coverage. Life insurance is not the only benefit that employers have curtailed since the Great Recession. The study, Hidden Currents: Under-the-Surface Changes in the Employee Benefits Market, revealed that benefit penetration rates are nowhere near the level they were pre-recession. Despite the improving economy, employers are cautious due to the challenges that ACA legislature is posing and increases in the average annual premium for employer-sponsored health insurance, which drive employers’ overall benefit policies. 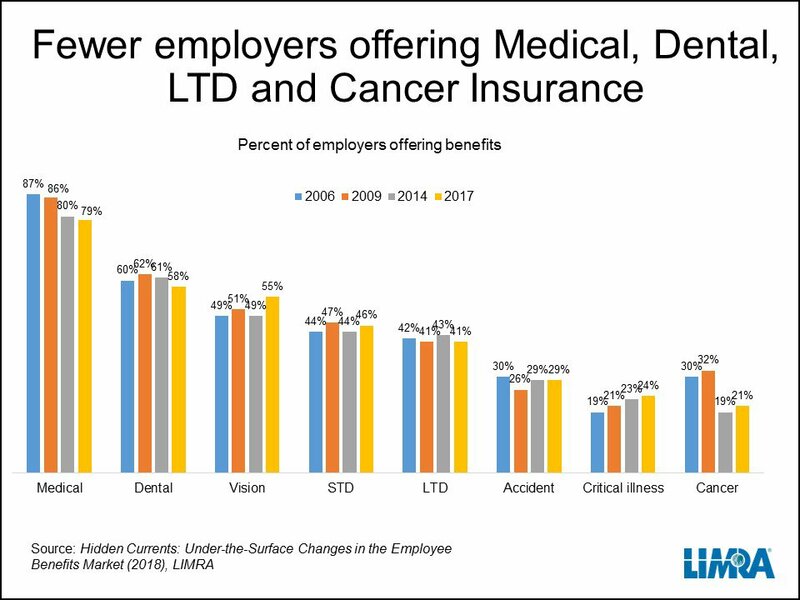 The study shows there is a drop in the overall percent of employers offering various benefits, including medical insurance, dental insurance, long-term disability insurance and cancer insurance. It would appear the improved economy has not changed employers’ strategy around benefits. 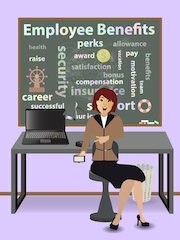 LIMRA finds on average, employers offered seven benefits to their employees in 2017, down from eight benefits in 2014. In addition, only 1 in 10 employers who currently offer insurance benefits plan to add a benefit in the next 18 months. In September 2017, LIMRA surveyed 1,497 U.S. employers with 10 or more employees that had been in business for at least three years. Respondents were the individuals that made or shared in the firms’ decisions concerning employee benefits. The sample was weighted by company size and industry to be representative of the total population of U.S. employers with 10 or more employees, based on data from the U.S. Census Bureau. ABOUT LIMRA: LIMRA, a worldwide research, learning and development organization, is the trusted source of industry knowledge, helping more than 850 insurance and financial services companies in 64 countries. Visit LIMRA at www.limra.com. Of course employers have stopped offering life insurance. They’ve realized that the insurers, through Erisa laws, have shifted their liability to the sponsoring employers. Why would any employer want that responsibility? Agents need to be the ones to change this trend by refusing to even offer employer-sponsored life insurance. When premiums stop coming into insurers they’ll adjust their product offerings and accept the liability an insurer should be accepting as a regular business practice. 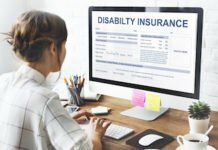 Here’s a great read about how employers and employees are being victimized by employer sponsored life insurance plans: https://cflid.com/employee-life-insurance/. Nice article, thank you Insurance-Forums! 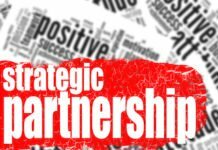 We enroll businesses large and small in the Heartland Association .. Benefits include UNLIMITED Telemedicine ..and a $5,000.00 Group Life Insurance Policy .. I never realized the evil of employer sponsored health plans. But I am smart of enough to know that the lump sum payoff can't be that good. I'm curious if it's requirement to have it . I think my employer offers it for free. Also I'm curious if certain companies offer good plans. Most likely less loopholes and variable options. Of course employers have stopped offering life insurance. They've realized that the insurers, through Erisa laws, have shifted their liability to the sponsoring employers. Why would any employer want that responsibility? Agents need to be the ones to change this trend by refusing to even offer employer-sponsored life insurance. When premiums stop coming into insurers they'll adjust their product offerings and accept the liability an insurer should be accepting as a regular business practice. Here's a great read about how employers and employees are being victimized by employer sponsored life insurance plans: https://cflid.com/employee-life-insurance/. Outside of erisa, insurance companies have to give timely notification to a policy owner of a past due premium, lapse, and reinstatement. They also have to offer third-party notifications. 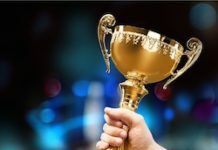 Under erisa, the employer gets these responsibilities and if they don't properly notify the owner of losing coverage, or if they give wrong information, they can be liable for the death benefit. It's all detailed in the link I added to my first comment. Some of the employer offer health insurance benefits to their employees. Health insurance should be included in employees's salary.